1Academic Unit of Respiratory Medicine, Royal Hallamshire Hospital, and Depts of 2Acute Medicine and 3Respiratory Medicine, Northern General Hospital, Sheffield, UK. Flexible fibreoptic bronchoscopy is a safe procedure with a major complication rate of <1% in most published studies 1. In one retrospective study of >4,000 bronchoscopies, major complications (respiratory failure, pneumothorax and pulmonary haemorrhage of >50 mLs) occurred in 0.5% of procedures and minor complications (laryngospasm, vomiting, bronchospasm, vasovagal syncope and epistaxis) in 0.8% of procedures 2. Herein we report an important, rare complication of bronchoscopy that, once recognised, is treatable by prompt action. A 49-yr-old female underwent elective flexible bronchoscopy during investigation for suspected Mycobacterium tuberculosis. The oropharynx was sprayed with a topical local anaesthetic and intravenous midazolam was used as a sedative. An Olympus BF-260 bronchoscope (Olympus Medical Systems Corporation, Tokyo, Japan) was introduced via a plastic mouth guard (Olympus Endoscope Mouthpiece, 20 mm×27 mm; Olympus Keymed Ltd, Southend-on-Sea, UK). No endobronchial abnormalities were noted and bronchial washings were obtained without any apparent immediate complications. During recovery sudden onset facial pain developed and it was noted the patient was unable to talk or fully close the mouth. The diagnosis of bilateral temporomandibular joint (TMJ) dislocation was made clinically and confirmed by radiographs (fig. 1a⇓ and b). The mandible was successfully relocated using the classical reduction technique and symptoms resolved. A repeat radiograph was performed (fig. 1c⇓ and d). 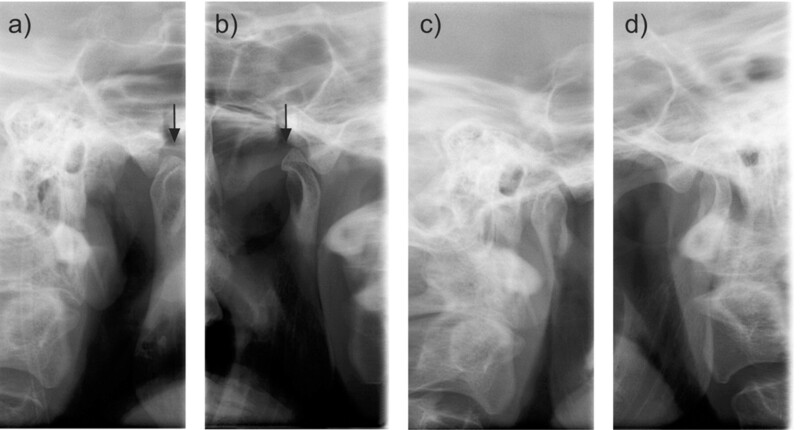 Radiographs showing a, b) bilateral temporomandibular joint dislocation, and c, d) the temporomandibular joints following relocation of the mandible. The arrows indicate the condylar heads of the mandible. Only three other cases of TMJ dislocation following bronchoscopy have been reported in the previous literature; however, there have been several reports involving other procedures including upper gastrointestinal endoscopy, dental procedures, endotracheal intubation and pulmonary function testing 3–8. TMJ dislocation almost always occurs anteriorly. The condylar heads of the mandible are forced out of the glenoid fossa to a position anterior to the articular eminence of the temporal bone. Movement of the condylar heads anterior to the articular eminence followed by spontaneous reduction is termed subluxation. On later questioning, the patient recalled one episode of previous TMJ subluxation following a dental procedure. Previous case reports of iatrogenic TMJ dislocation have involved patients with a history of TMJ subluxation, the use of periprocedural sedation or a combination of both factors 3–8. However, i.v. midazolam was only used in around half of the reported cases. Midazolam has centrally acting muscle relaxant properties and a half-life of 1.5–3 h 9. It is widely used in the treatment of muscle spasm and to assist reduction of dislocated joints 9 but in this case reduced muscle tone may have contributed to TMJ dislocation. Prompt reduction of TMJ dislocation is easier and associated with less morbidity than if reduction is delayed 5, 6. When diagnosed clinically, an attempt should be made to reduce the dislocation before spasm of the muscles of mastication makes reduction more difficult. If midazolam has been used, the effects should not be reversed with flumazenil prior to the attempted reduction unless clinically indicated. There are several reduction techniques 10. The classical reduction method involves the practitioner standing in front of the sitting patient and placing gloved thumbs deep into each of the patient's lower molar regions 10. To improve grip and reduce possible trauma to the practitioner's thumbs, gauze swabs may be placed on top of the patient's lower molars. Ideally the patient's head should be supported by a head rest. The practitioner's elbows, with forearms flexed at 90 degrees, should be no lower than the patient's mandible. The practitioner's fingers wrap laterally around the mandible. Constant pressure is applied inferiorly with the thumbs, while the fingers tilt the mandible through upward pressure on the mentum. The condylar heads should move inferiorly and posteriorly into the glenoid fossa. We describe a rare complication of bronchoscopy which respiratory physicians need to be aware of when performing peroral bronchoscopy. Patients with a history of TMJ subluxation are at a high risk for this complication during any bronchoscopic procedure. Physicians may consider risk reduction by selecting the alternative nasal route or alternatives to muscle-relaxant sedation in this high-risk group. Early recognition of this unusual complication of bronchoscopy reduces further morbidity enabling prompt, effective treatment. British Thoracic Society Bronchoscopy Guidelines Committee, a Subcommittee of Standards of Care Committee of British Thoracic Society. British Thoracic Society guidelines on diagnostic flexible bronchoscopy. Thorax 2001;56: Suppl. 1 i1–i21. Pue CA, Pacht ER. Complications of fiberoptic bronchoscopy at a university hospital. Chest 1995;107:430–432. Kim SK, Kim K. Subluxation of the temporomandibular joint. Unusual complications of transoral bronchofiberoscopy. Chest 1983;83:288–289. Nusrath MA, Adams JR, Farr DR, et al. TMJ dislocation. Br Dent J 2008;204:170–171. Lacy PD, Lee JM, O'Morain CA. Temporomandibular joint dislocation: an unusual complication of upper gastrointestinal endoscopy. Am J Gastroenterol 2000;95:3653–3654. Oliphant R, Key B, Dawson C, et al. Bilateral temporomandibular joint dislocation following pulmonary function testing: a case report and review of closed reduction techniques. Emerg Med J 2008;25:435–436. Mangi Q, Ridgway PF, Ibrahim Z, et al. Dislocation of the mandible. Surg Endosc 2004;18:554–556. Nordt SP, Clark RF. Midazolam: a review of therapeutic uses and toxicity. J Emerg Med 1997;15:357–365. Chan TC, Harrigan RA, Ufberg J, et al. Mandibular reduction. J Emerg Med 2008;34:435–440.